The United States Mint released the candidate designs developed for the Apollo 11 50th Anniversary Commemorative Coin program. 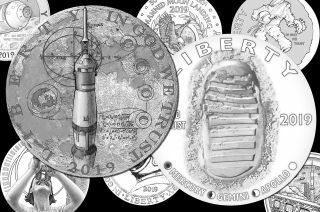 The United States Mint has revealed the candidate designs for the "heads-side" of its planned coins for the 50th anniversary of the first moon landing in 2019. The 18 designs for the Apollo 11 50th Anniversary Commemorative Coin program were reviewed by the Citizens Coinage Advisory Committee (CCAC) at a meeting on Oct. 18 and by the U.S. Commission of Fine Arts (CFA) the following day. The two panels reviewed the Mint's designs for the "tails-side," or reverse, in June. As called for by Congress in legislation approved in late 2016, the Mint will issue curved gold, silver and clad metal coins to recognize the Apollo 11 mission's 50th anniversary. Sale of the coins will benefit the Astronauts Memorial Foundation, the Astronaut Scholarship Foundation and the National Air and Space Museum. Following the criteria outlined in Public Law 114-282, the obverse of the coins will be concave, or bowl-shaped, and feature artwork "emblematic of the United States space program leading up to the first manned moon landing." The artists' candidate designs include representations of the Saturn V rocket that launched the astronauts to the moon; the Apollo command module on board which the astronauts flew to and from the moon; Mercury, Gemini and Apollo astronauts and their spacesuits; NASA's Mission Control; and the moon itself. The American bald eagle, which was central to the design of the Apollo 11 mission patch and served as the namesake for the mission's lunar lander, also featured on several of the designs. The images of a bootprint on the moon, President John F. Kennedy and engineer Robert Goddard's first liquid propulsion rocket also appear on some of the submissions. In an Oct. 27 letter to David Motl, the acting deputy director of the U.S. Mint, CFA secretary Thomas Luebke summarized the commission's thoughts on the designs. The members of the Citizens Coinage Advisory Committee and the U.S. Commission of Fine Art expressed support for this design, featuring the Saturn V rocket, for the obverse of the Apollo 11 50th anniversary coins to be released in 2019. "The commission members supported the presented intention for the obverse to represent the combined efforts of many people in achieving the goals of the Apollo program, complementing the reverse depiction of the lunar landing itself," Luebke wrote. "They noted some of the artists chose to illustrate this theme by depicting one person as a representative of the group effort." "The commission members commended the strength of these compositions," said Luebke, "but they expressed concern that it is difficult to represent the very wide range of people involved in or affected by the space program with a single generic figure; they therefore discouraged the design approach." The members voiced their support for a design featuring Mission Control, but felt "this busy composition" would work better if simplified. They also encouraged the design approach of using technical elements to symbolize the achievements of the space program — "such as the early Goddard rocket" — but cautioned that such design elements "should be understandable by the general public." The CFA members expressed concern that the motif of an astronaut's footprint in the lunar soil, "may seem overly familiar," wrote Luebke. They "strongly supported" a design showing the Saturn V rocket and the mission's trajectory set against the lunar surface, but acknowledged that it relied on "delicate line-work that would be illegible at the scale of the smaller coins in this program." The CCAC members gave the Mint similar feedback, identifying the same Saturn V and trajectory design as one of their two favorites among the 18 reviewed. The members' other preference was for the depiction of the bootprint in the lunar soil, but like the CFA, expressed concerns about it not being original. A jury comprised of three members of the CCAC, three CFA members and chaired by the deputy assistant secretary for management and budget for the Department of the Treasury will select the winning design, to be announced in 2018. The winning artist will have his or her initials engraved on the minted coins and will receive $5,000. Each of the 18 artists who created a design for consideration will be paid $500 for his or her submission. The Mint did not release the names of the 18 artists. The U.S. Mint will issue as many as 1.3 million gold, silver and clad coins, ranging in tender value from half a dollar to $5 each, in time for the 50th anniversary of the Apollo 11 mission in July 2019. See all 18 designs for the U.S. Mint's Apollo 11 50th anniversary coins at collectSPACE.